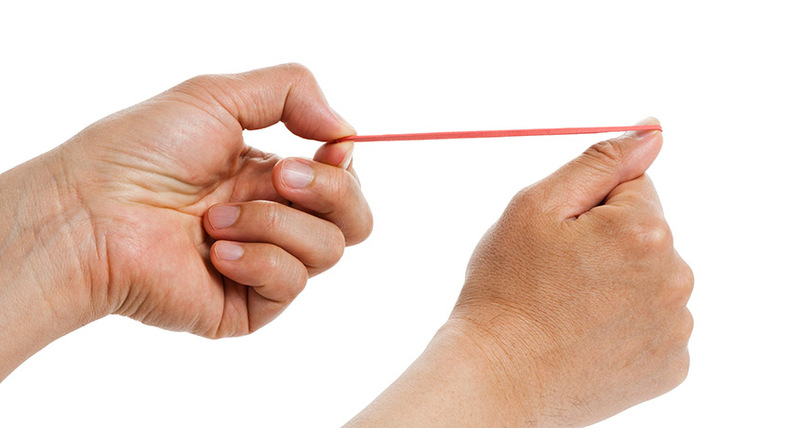 The Physics of Flicking Elastic Bands. It is something most of us have done at some point in our lives but the joy of a successful elastic band flick can often be tempered by a swift slap on the back of your thumb from the elastic band as it flies forward. Some stunning slow motion footage from researchers from Boston University reveals the perfect flick relies on a number of things. The study concentrated on the classic technique of the band being past around one thumb and fingers on the other hand pulling the band back before releasing it. The perfect flick relies on being able to move the thumb out of the way fast enough that it does not impede the band as it flies forward. As the band is released the tension in the band causes its rear end to shoot forward as the whole band also moves forward on its path toward its intended victim. Herein lies the jeopardy. The study found that if you pull the band back too far there is too much tension causing the rear of the band to shoot forward faster than the whole band moves forward, giving you a swift slap on the back of the thumb which cannot move out of the way fast enough. It seems the perfect flick relies on a more modest amount of pull.